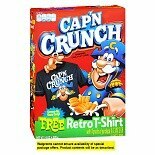 Shop Cap'n Crunch Sweetened Corn & Oat Cereal (14 oz. )14 oz. 2 for 7 dollars and 00 cents or 1 for 3 dollars and 99 cents 2/$7.00 or 1/$3.99$0.29 / oz.